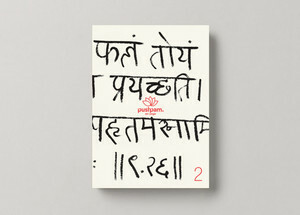 “‘Pushpam’ means ‘flower’ in Sanskrit. In India, a flower is used in ceremonies as an offering to God, marking special occasions or even to mourn the dead. A flower, in the full of its life, yields nectar and often turns into fruit and seed. Yet its existence is temporary for at some point it perishes and returns to the ground from whence it came. It is both the beginning and the end. Pushpam is a yoga magazine written and published by the certified teacher Hamish Hendry and his team from Ashtanga Yoga London. It is a thought provoking and often inspiring quarterly that features a collection of essays on philosophy, personal experiences, interviews…and this particular issue even a recipe for Bone Broth! Pushpam’s website mentions that it aims to “move beyond Asana” or as Hendry writes, “to inspire yoga students, helping them feel more positive about their practice and hopefully learn a little bit more that what they discover on the mat”. I think it is this, which makes Pushpam such a special little gem of a magazine- it brings us back to what yoga is truly about in a very accessible and non dogmatic manner- providing some space between the physical and spiritual. It is not concerned with glossy pictures selling the latest yoga merchandise or giving a step by step on how to put your legs behind your head; instead it aims to dig deeper and move beyond postures. Whilst the first issue of Pushpam was more of an eclectic mix of musings, Pushpam 2 has a theme: The Bhagavad Gita written in classical Sanskrit tells the story of Prince Arjuna and his struggle or dilemma to fulfil his duty as a warrior. Rather then attempting to give us a direct translation or interpretation of the Bhagavad Gita, it offers a variety of contributions that place this story in a broader context and allow us to ask questions about ourselves and each other (and how we can make it relevant to our daily life and practice). Academics such as Ruth Westonbury, Mikel Burel and Graham Burns offer a scholarly analysis of this story, shining a light on things like the true meaning of Dharma and focus on specific aspects or elements of the text-and in doing so inspire further questions as well as providing elaboration. Westonbury’s piece on the poetic language used to convey sacrifice is particularly powerful: “The Gita’s verses on sacrifice can be deployed on the mat. The sequences of asana are testtubes within which whatever is arising in our bodies, hearts and minds is heated, catalysed. Seeing our patterns, hates and fears as honestly as we can allows them to be released”. Through its portrayal of sacrifice, the Gita expresses our own sense of conscience — how we should and shouldn’t act and the ethical dilemmas we face in living our lives. In her essay on being a parent, Shamila Desai asks how we can pass on the Bhagavad Gita to our children and, in turn, to future generations. It made me think that we are all parents or guardians to some extent, be that of children or our planet- and it is our behaviour now that shapes tomorrow. That in turn forces us to confront and evaluate our actions and what asks what kind of legacy we want to leave behind? “By keeping the Gita lovingly alive in their childhood, we aspire that when our children are haunted by doubt or are fulfilling their dharma, their natural instinct will be to find their very own Krishna, their inner God or consciousness, as a beam of knowledge and hope”. I particularly enjoyed the interview or conversation between Hendry and Richard Freeman in which we get an open and honest discussion on subjects ranging from the practice itself and questions like what it means to be a bad student or teacher, if there even such a thing, as well as brief digressions on Kung Fu! You feel you are almost witnessing the conversation first hand, and therefore part of the discourse between these two very respected teachers. I think it brought home to me that our teachers are also asking the same questions we are, and one of the most memorable lines for me is when Hendry says to Freeman, “you almost have to ‘unbelieve’” to which Freeman replies, “yeah, you have to let it go”. It illustrates the point nicely that yoga is as in life — we are not always going to get answers to our questions and ultimately we have to just sometimes surrender to that, to be content with unknowing and be open to discovery. There is a very touching and raw piece written by journalist Mathew Green who spent time in Afghanistan which gives a vivid picture of the effects of war and the fact that despite a battle being over, the debris it leaves behind can have a devastating affect. This is captured in his description of the psychological scars born by a soldier whose eventual salvation is found in meditation: “I had ten seconds of peace…for fifteen years I had never had peace in my mind…. then the realisation came: if I can get ten seconds what about a couple of minutes? A ten minute break from myself?”. In one of the last chapters in Pushpam, Genny Wilkinson Priest explores what changes (if at all), in our physical practice occur when we age, if it gets harder or easier and what we as practitioners can learn from that process. I think what stuck out for me most in this article, where Priest asks a number of senior teachers about ageing through their practice, goes back to what Hendry and Freeman touched upon in their conversation earlier- the beauty and peace of letting go and not being driven by ego or attachment to postures. Bill Brundell, a 60 year old authorised level two teacher captures this quite potently when he says “There are no heights to attain in yoga”. This essay led me to contemplate that whilst age is one way of marking changes in our practice, it is in fact always evolving and changing; we frequently adapt to changes in our physical selves as well as psychological changes. What’s important is not the form of what we practise on the mat but rather the support we get from our practice and how it helps to shape us as people and our behaviour. Senior teacher Rolf Naujokat offers some advice on this and the futility of holding on when he says: “Everything comes and everything goes”. Naujokat used to practice third and fourth series everyday- but it was when he became injured that he reached this enlightenment. I felt that what if we could learn from these renowned practitioners and instead of waiting years to reach the point of acceptance, start now- begin to break through the “older and wiser”, and start to be wiser now! Priest ends her essay with a quote from Guruji: “Yoga is an internal exercise, the rest is circus”.